If Kareem Etheridge had mirrored what he saw growing up, he might be in jail like one of his brothers. Or dead, like another brother. 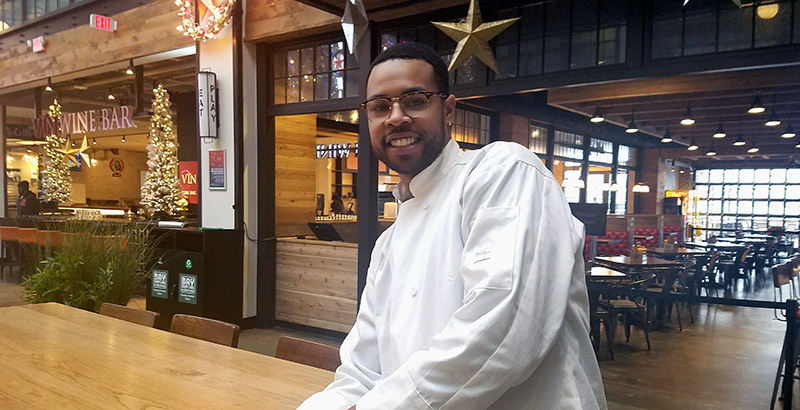 Instead, Etheridge is graduating from Tidewater Community College with an Associate of Applied Science in Culinary Arts and talking about the someday restaurant he wants to call Kareem the Dream Food Palace. “It took me a long time to trust, but the people of TCC believed in me, loved me and showed me that I could be whatever I desired to be. They accepted me and didn’t judge me and inspired me to keep moving,” said Etheridge, 29, the first among his 12 siblings to earn a college degree. His grandmother kept him straight as a youngster, but her passing when he was 10 forced him to grow up fast. He was 13 when he started working in fast food to help his mother with rent money. He struggled with grades, escaping with football by playing a couple of seasons at both Ocean Lakes and Nansemond River high schools. He wanted to have two parents in the stands, but he had only one. Directionless, he mimicked the lifestyle he saw on the streets of South Norfolk. He drank. He smoked. He did things he wasn’t proud of. But he also realized he didn’t want to be another grim statistic. In 2013, Etheridge cut his dreadlocks, moved in with his sister and enrolled at TCC’s Norfolk Campus all in the same week. Growing up, Etheridge found a passion for cooking while working alongside his grandmother. When he started school, his mother encouraged him to pursue culinary arts. He didn’t just find food at TCC. He found friends in Emanuel Chestnut, dean of Student Services on the Norfolk Campus, and staffers Sonya Fitchett and Tramisha Croker. He also found support in the Student African American Brotherhood, a student organization designed to empower and engage young men. Chestnut could not be more proud. Today, Etheridge cooks in three places: The Harbor Club, Stripers Waterside and Palm Gardens, a Norfolk catering venue. He continues to plan out his dream restaurant that will feature Southern food like your grandmother’s best. Etheridge is already paying it forward. A classmate who fell on hard times has moved in with him. The two will walk the stage together on graduation day, Dec. 18. Etheridge shares these encouraging words for anyone struggling to make a go of it.